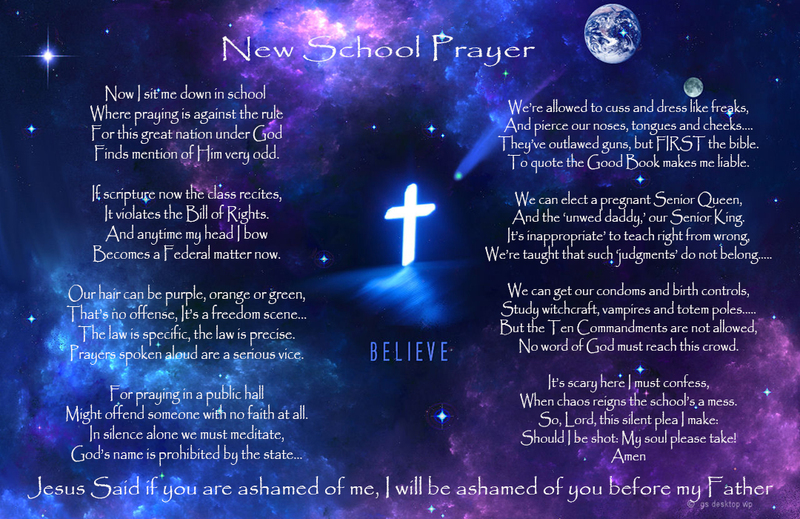 This entry was posted in Images, Random Stuff and tagged A+, Awesome truth, New School Prayer by Tigger. Bookmark the permalink. So much truth to that prayer. It's a shame that Christians are discriminated against so much here in North America – a land that used to offer and promise freedom. Now one of the only things we are free from is God – and that's not so good. I'm glad that I am on the Lord's side. Thanks for sharing! Indeed, it is sad that people will say oh ok to do everything else, even though they may know it’s wrong, but to them it’s “better” than putting God first. I have prayed in school quietly to myself, exspecially before an exam or test of some sort. I’ve shared alittle bit in school before and if I didn’t share too much I think most people probably have an idea that I was different. On a sad note people probably thought I was mormon because I didn’t didn’t drink, Lol. I simply said nope, I’m a Christian, I just choose not to drink.